Photographer: Thierry Le Goues. Model(s): Anja Konstantinova, Arlenis Sosa, Ashley Smith, Ava Smith, Chrystal Copland, Deimante Misiunaite, Heidi Mount, Irina Denisova, Keilani Asmus, Marihenny Rivera, Merethe Hopland, Tian Yi, Vasilisa Pavlova, Vika Falileeva. Source: French Revue de Modes. Stylist: Marcell Rocha. 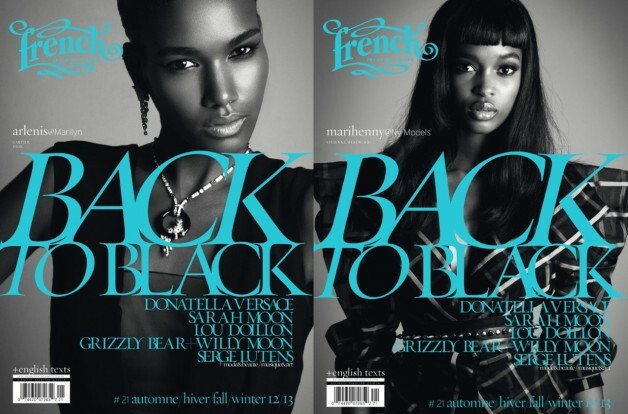 The F/W 2012 issue of French Revue de Modes gathers a group of today’s freshest faces, for a variety of cover-shots by Thierry Le Goues. ‘Back to Black’ celebrates our obsession with black-on-black fashions, highlighting Fall’s best from Gucci, Dior, Chanel, Stella McCartney, Versace and more. Ashley Smith, Heidi Mount, Arlenis Sosa, Vika Falileeva, Ava Smith, Merethe Hopland, Marihenny Rivera, Vasilisa Pavlova, Tian Yi, Anja Konstantinova, Chrystal Copland, Deimante Misiunaite, Irina Denisova and Keilani Asmus show the diversity of this season’s styles, with looks that range from daytime cool to evening formal – styled by Marcell Rocha. Source (FGR).